CBD CARAMEL™ is a CBD enriched exotic 3-way fusion, culminating in a 70%/30% Indica dominant strain with a 1:1 CBD-THC ratio. This plant has dynamic growth from the start so the vegetative stage can be kept to a minimum. The flowering phase produces a very resinous, Sativa like flower structure, that is complete in just 60 days! An average indoor yield of 500 gr/m2 is easily attainable and CBD CARAMEL™ is ideal for outdoor growing and in humid climates. 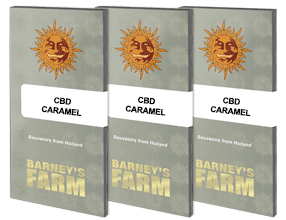 CBD CARAMEL™ produces sweet sticky buds whose psychoactive effects are mellow, cerebral and comforting to patients needing to medicate while free from a stoned effect.